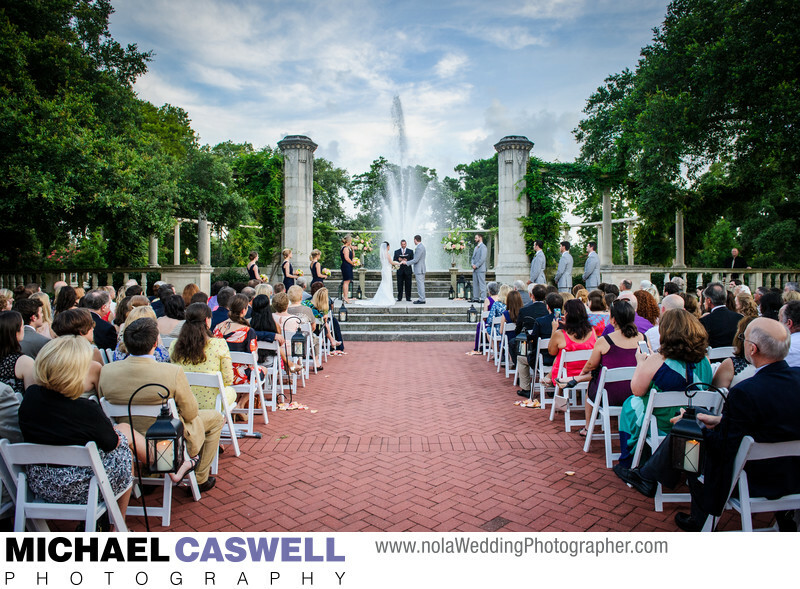 Popp Fountain in City Park is a fabulous place to have an magnificent and memorable outdoor wedding ceremony in New Orleans. Named for John F. Popp, it was built in 1937 as a Works Progress Administration project, and was recently restored to its full glory. The huge sprays of water emanating from the fountain and the elaborate decorations and columns makes for a wonderful background for a ceremony. There is plenty of space on the brick paved patio in front of the fountain for a large number of seated guests, and the steps of the fountain are also ideal for large group formal photographs. It also looks quite impressive at night, making for unique and dramatic portraits of the bride and groom, and the steps make it a perfect spot to do the formal group shots, even with larger bridal parties and big families. It's also the ideal choice of location for the couple to have their first look if they are choosing to see each other before the ceremony. This site also offers the benefit of being adjacent to the Arbor Room, City Park's newest wedding and event space, a modern and spacious reception venue that is a pleasure to shoot at. Their close proximity makes this pair a great choice for an outdoor ceremony and indoor reception, and offers the reassurance that just in case the weather is not ideal, an indoor ceremony space as a backup is only steps away. Location: 30 Zachary Taylor Dr, New Orleans, LA 70124.